A dual recipe for both burgers and accompanying relish. In a bowl, combine the beef, red onion, cornichons, parsley, worcestershire sauce and mustard; season generously. Shape the mixture into 4 patties. Chill for at least 30 minutes or overnight. Meanwhile, for the relish, simmer the shallot, chilli, garlic, sugar, chopped tomatoes and vinegar in a small pan for 30 minutes, stirring regularly, until thick. Leave to cool, then chill. Brush the burgers with the oil; griddle for 4–5 minutes on each side, until marked but still juicy. 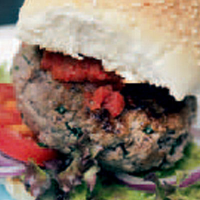 Serve in the buns with lettuce, tomato, onion and a dollop of the relish. This recipe was first published in September 2010.